The first book I revisited was Lost Worlds vol. 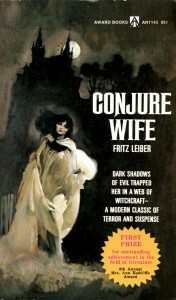 2 by Clark Ashton Smith, and I have to thank it indirectly for my discovery of Fritz Leiber. I guess I would have been around 15 and was reading typical eighties horror / fantasy and SF. Stephen King, James Herbert, Harry Harrison and Larry Niven. Basically what was available at my local bookshop in Peterborough, which in all honesty wasn’t very much; had I lived in Cambridge, I may have had a better range. I was reading through David Edding’s Belgariad series without any huge enthusiasm, so I had a rummage on the bookshelf in our living room. My Mother read drama and biography, my Dad was a great reader of spy thrillers, Deighton, Le Carre, more general war fact and fiction, as well as lots of books on theatre and drama. I have come to love Deighton and Le Carre, but they held no interest to my 14 year old self. There were well thumbed copies of Lord of the Rings and The Hobbit, I had enjoyed the latter and struggled through the former finding in dry and slow in places. Then I found Lost Worlds Vol.2, to this day I do not know what it was doing there. I mentioned it to my Dad a few years later and he had never heard of it. So fate placed this rather tatty paperback in my hand. The cover was terrific, and inside I found a whole new world ! The texture of the language, the narratives, everything was so far away from what I had been reading, which seemed so much more direct. 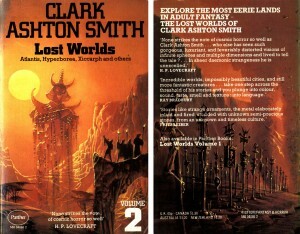 I was hooked and decided I was going to find more Clark Ashton Smith. I also noticed these intriguing names on the back. H P Lovecraft, Fritz Leiber and Ray Bradbury. The latter I was aware of, there had been the weird, slightly unsettling TV series, and I knew I had seen some of books for sale. My hopes of finding Clark Ashton Smith were dashed, nothing to be found in either Sherrat & Hughes, W H Smith or the book stall on the market. But I did find books by H P Lovecraft and Ray Bradbury. I came home the proud owner of The Small Assassin and The Haunter of the Dark and Other Tales of Terror, over the next few years I snatched up everything I saw by Lovecraft, Bradbury and Smith, and on a trip to Brighton, I saw a book by Fritz Leiber, Swords Against Death. The first story I read was ‘The Bleak Shore’, there was definitely that strange texture I associated with Lovecraft and Smith, but more but with a healthy dose of realism, and as I read more I discovered an sharp and witty sense of humour too. I was hooked. So one small paperback led me to find a whole new area of literature, and a lifelong passion. I hadn’t read Lost Worlds for many years, but that strange sense of dread and melancholy was still there and for anyone who has not read read Clark Ashton Smith, it is well worth a read. 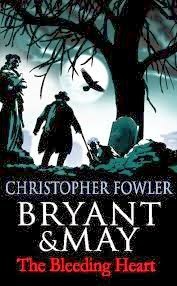 Christopher Fowler‘s Bryant & May series has become a firm favourite of mine. I had a week where I was going to be driving backwards and forwards to London so bought the audiobook CD. I was hooked (for audiobook fans The Bryant and May books are read quite brilliantly by Tim Goodman, I reviewed it several years ago on my radio reviews site), the series has gone from strength to strength and remains a very strong series. The Bleeding Heart proved to be another excellent novel balancing humour, thrills and fascinating facts with a wonderfully realised cast of characters. It is lovely to follow a series of books which has not gone down in quality over the course of the books. If you want to enjoy some great crime fiction, then you have to give these series of books a go. I don’t want to enter into discussion on the role of the feminine in the novel, I feel it is a very complex issue. Norman is undercut at several points in the narrative, and only really proves effective when he loses his intellectual arrogance and does what Tansy tells him, so the male hero only arrives at that status by the end of the novel. The college life is well drawn, and the tension of witchcraft rides well on this bed of mistrust, intrigue and hostility. These are key, it is this life of both the intellect and backbiting and intrigue which give the central thread of the novel such a feeling of realism. The standout moments are two key sections. The scene where Tansy is using a cats cradle to capture the approaching stone lizard and the following delirious scenes where Norman realises he is destined to die and Tansy drunkenly takes his torments away and places them on herself. The scenes following Tansy’s emergence from the water are just wonderful, with discussions of souls and the key scene where the ordinary cleaning girl comes in and admits to her own use of magic, her mothers and by implication all women’s knowledge of a far older and more powerful practice than all the science in the world. The ending is neat and tidy, and is perhaps the most traditional element of the book, but what stays with you is the concepts, the power of key scenes and the genuine sense of unease he generates. There is a strong feel of Weird Tales to the novel, something that faded from Fritz’s work as his style became more distinct (it is still apparent I feel in Gather Darkness), and that is one of the pleasures of the novel. 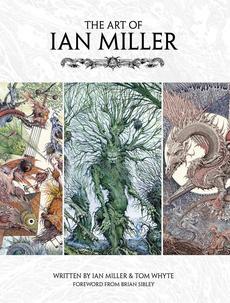 Lastly, was the beautiful book, The Art of Ian Miller. The rather wonderful blog by unsubscriber brought this to my attention, and it is simply captivating. Ian has done a wide range of SF / Fantasy / Horror covers, and many of you will recognise his work if you see it. His spidery organic art is just astonishing and demands attention, and I found myself noticing new details and flourishes in every illustration.